Explore a land where the sun rises from the clear-blue Coral Sea, and sets behind rugged volcanic peaks of an enchanting hinterland. A world of discovery is illuminated with the dawn of a new day, from the glistening golden sand of one of Mackay’s pristine beaches, to the verdant rainforest-clad mountains, lightly veiled in morning mist. From breakfast on the beach sharing a vivid sunrise with wallabies to dining in a modern marina; it is possible to experience the magic of The Mackay Region in three days. Start at Cape Hillsborough National Park: Take photos with the kangaroos and wallabies at sunrise and enjoy a bushwalk to Andrews Point to see turtles and other marine life. Tip: Stop in at the Old Station Teahouse. They serve delicious scones with homemade jam and cream. Scenic Drive through the Pioneer Valley: Enjoy picturesque views of Mackay’s hinterland. 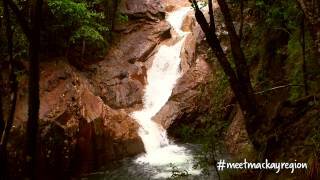 Swimming in the fresh water at Finch Hatton Gorge is a must – it’s literally breathtaking. There are also a number of walking tracks and waterfalls to explore. Tip: Stop at the Pinnacle Family Hotel on the way to Finch Hatton Gorge for a famous Pinnacle Pie. Eungella National Park: Welcome to Eungella, where the air is clear and the scenery is spectacular! Travel along the winding EungellaDam Road, surrounded by lush rainforest. You’ll soon find Broken River Mountain Resort – a unique family-friendly retreat, offering good accommodation and hearty meals. Tip: Indulge in a delicious meal at Possums Table Restaurant. Platypus in the Wild: Can you spot the platypus? Dawn or dusk are the best times to see them via the viewing platforms near the Broken River Visitor Information Centre. From here, you can also explore more of the spectacular rainforest with a variety of walking tracks. Tip: Stop in at Platypus Lodge or experience the Eungella Chalet for great food and awesome views. South to Sarina: Approximately one and a half hours from Eungella. Enjoy a tour of the Sarina Sugar Shed, a miniature sugar mill and distillery with guided, interactive tours. See how sugar is grown, processed, milled and distilled and taste the products made on site. Tip: Sarina Beach is just a few minutes away and is fringed by an esplanade park with barbecue facilities. Great spot for fishing or a picnic. Botanic Gardens in Mackay: On the way back to Mackay, stop in at the Mackay Regional Botanic Gardens on Lagoon Street overlooking a freshwater lagoon. Tip: There’s a heap of family-friendly restaurants with vibrant dining options in Mackay’s City Centre, or along the river at Caneland Central. The Mackay Marina: A short drive from the Mackay City Centre, the Marina Village offers magnificent views of the Harbour, with breezy walks and contemporary dining options available. Tip: Breakfast is served at The Clarion Hotel’s Latitude 21 Restaurant daily from 6.30am, with spectacular views of the Marina. Explore the Northern Beaches of Mackay: Take a self-guided drive down the Mackay-Bucasia Road. Stop in at Eimeo Beach, patrolled during the school holidays. It’s a little slice of paradise without the crowds! Tip: ‘Lunch with a million-dollar-view’ at the historic Eimeo Pacific Hotel is an experience you should not miss! Fishing and exploring: If you’re up for some fishing or water sport activities, head to Shoal Point; the most northern beach along that stretch of coastline. The kids can enjoy the playground on the esplanade or take a dip in the sea. It’s worth staying for sunset, as the colours are spectacular.